(Something-something) Jaga to tomato no chiizu yaki / grilled cheese with potatoes and tomato. And well, there's just two slices of tomato. Because one whole medium-sized tomato here is already about 100 yen each. Meanwhile, you can get maybe a kilo of potatoes for as low as 100 yen if you know where to look. This "bento" is 360 yen from 3F. There's also a piece of broccoli in there, some slices of sausages (weiners), and some tomato sauce. Yup, that just happened. Last Sunday evening. Took this photo at around 9:30am on Monday morning. But after 2 hours, all the snow in this photo had already melted (and then evaporated) away. Bento! #218: "W Modan (Soosu Yakisoba)"
Modan means "modern!" :D Anyways, while the label says yakisoba, this looks more like okonomiyaki-topped yakisoba. But indeed, inside the okonomiyaki are even more yakisoba! Also, the sauce is okonomi sauce. But yeah, it's used on yakisoba too. As well as mayonnaise. Forgot to post one yesterday. Super busy! But, one is coming soon. Regular posts start tomorrow! Thanks also for visiting regularly, guys! I'm close to 4,000 pageviews this month. It's just getting bigger each month! I hope to post more interesting stuff soon. Please do leave a comment if you have questions about my posts or if you have requests, or if you yourself have tried the things I've talked about. Thanks a bunch! どうもありがとう！Doumo arigatou! Actually, there should be more. Also, there's one Filipino word in that list. Also, early and fast are the same word in Japanese; so when you're early to work, you're fast! Similarly, late and slow are the same word in Japanese. Sort of makes sense, no? This had a very nice presentation when I bought it. But during transport, it ended up like this. It's 498 yen, and it's a "typical" katsu karee with sauce separate from the rice and the katsu itself and the pickled radish, but instead of the usual tonkatsu or pork cutlets, this one has chikin katsu, or chicken cutlets. Quite yummy and fulfilling. Bento! #215 and #216: Gyuu Niku Dzukushi Bentou and Nasu No Something-Something in a "Cup"
Tasted pretty good actually. Lots of stuff in there. Ground beef. Beef strips. Some spinach? A kind of mushroom? Egg. Taro? Carrot. Pink pickled radish. For added veggies, I got this new eggplant thing that was swimming in water before I opened one corner to let all that water out (I tasted it and it didn't taste like vinegar). Not a bad addition to my beef bento. 190 yen, also from 3F. I've had a "Mega Mac" before, at a McDonald's in Taiwan in 2007. If a regular Big Mac has two patties and three bread/buns, that Taiwan Mega Mac had three patties and four bread/buns. This 2013 Japan version has four patties and three bread/buns! And it's yummy! It was difficult to eat though, compared to what I can recall from my experience with the 2007 Taiwan Mega Mac. There was a Japanese to my left who also ordered a Mega Mac and he was sitting comfortably with no Mega Mac in sight, as if he had easily conquered the Mega Mac and I didn't. I felt "insufficient," but I consoled myself with the thought that it's a skinny Japanese guy who's the hotdog sandwich eating champion for a number of years. It turns out that he had asked his wife to ask for a fork for him -- ha, I won that round! Hehehe. McDonald's also has this promo -- they serve you in 60 seconds or you get a free Big Mac. This is only for orders between 11:00 and 2:00pm. They were a little too kind, too. I thought their hourglass timer wasn't up yet when they had given me and the person in front of me a coupon each. Anyways, their "campaign" ran only until last January 14, I think. By the way, for some reason, I like the Quarter Pounder more than the Big Mac, but I seem to like the Mega Mac more than the Big Mac. I think it has to do with meat-to-bread ratio. The Big Mac is too much bread for my taste. Bento! #212: Something-Something Beef Stew "Hamburg"
530 yen (from 3F), but gone in a minute. 480 yen from 3F. This is supposedly two kinds of "stew" (hence the Double-U / W? ), a dark one (demi glace sauce? with potato, carrot, and some beef?) and a white one (cream-based sauce? with chicken, mushrooms, and broccoli), but they got mixed up during transport. Comes with a spoon, as it is for stew-like dishes (like curry). But, this is more rice than anything else. Definitely won't get this one again. Hachiouji / 八王子, literally "eight princes," a small town/city in the far west of Tokyo such that it's already to the north of Atsugi (while central Tokyo is about 50km to the east of Atsugi). This one is 420 yen, if I remember correctly, from the cafeteria. The only thing different between this and the regular ramen, I think, are the onion bits you can see on the left. Well actually, I forgot if the regular ramen has half an egg and some spinach. This, also, by the way, is soy-sauce-based. Not bad but not great. Bento! #209: CostCo Japan food! (Seafood) Paella. Yum. This was a bit dry though, but maybe it just needed to be heated. Or 金沢ソースカツカレー / kanazawa soosu katsu karee. 399 yen for an "M" size. This one uses chicken katsu instead of the usual pork, plus the sauce feels just a tiny bit spicier than the typical Japanese curry sauce. Came with shredded cabbage and the usual pickled radish. Or クリーミーチーズハンバーガー / kuriimii chiizu hanbaagaa. Only 294 yen from the cafeteria. Big slab of burger, with a creamy and cheesy sauce (note: it's not cream cheese), some salad veggies, and some fries. Yummy. Or chikin nanban / チキン南蛮 / fried breaded chicken fillet with tartar sauce and one other sweet oroshi sauce, comes with shredded cabbage / キャベツ / kyabetsu which I poured 1000 island dressing over. Namban actually means "southern barbarians," and was originally used to refer to countries south of Japan; i.e. the Philippines, Indonesia, etc. Note that the n / ん in Japanese, when succeeded by another syllable, is typically pronounced as m, like tempura should actually be tenpura. This one is 294 yen from the cafeteria. I ate it with my usual "S" barley rice, and salad bar salad. Nama = raw or fresh. Only 398 yen with not-so-raw egg, and some "bacon" (more like ham, actually). Well it's not technically a tonkatsu. First, they call it "crispy pork steak." 2nd, it's not cut, therefore it's not katsu. The sauce is also a little bit sweet -- the Filipino way! -- and very different from tonkatsu sauce. Together with a cream-based soup and a drink and rice, you get this for only 76 pesos (150 yen). The breading also looks closer to that for ebi fry than the typical tonkatsu in Japan. But of course I had to order a Chickenjoy! 1 hour of snow in (under) 1 minute! Please note that the above is the full-length video; I'll be uploading a more compressed, shorter video soon. My Filipino friend said "Yabu" stood for "82" which is a lucky number in Japan. I didn't find yabu in my dictionary though, but I found that 8 could indeed be ya (think yattsu) and 2 could be fu (therefore it could be bu) (i.e. think futatsu). I asked my Japanese friend if he knew what yabu meant and he said it stands for bush. He also said that 82 is not at all a lucky number in Japan. He added that Yabu might be a family name and that the owners of this restaurant are named Yabu. Searching the internet, it seems that this is a Manila-only (for now) restaurant. But you know, their food didn't taste unfamiliar to my Japan-trained palate. And people are loving this place. And more specifically, at the Robinson's Magnolia mall. I would think there's also a UNIQLO already at this mall. So far, I know there's one at the SM Mall of Asia and one at The Block at SM North Edsa. Last I checked, MUJI sells 1000 yen items in Japan for 1000 pesos in the Philippines; i.e. double the price. This thing is big in Manila, but I've only seen one so far in Japan, in Akihabara in Tokyo, and it seemed to be just a little hole in the wall. "100-yen stores" have been in the Philippines for a while now, but they sell the regular items at 88 pesos = i.e. around 170 yen. They do have 55 and 66 peso items, but those aren't typical Daiso items. Here, you might also notice they have a "Banzai" sale with a handful of items at only 25 or 50 pesos, but again, not exactly Daiso items. It's one thick slab of beef, with some string beans, a small piece of carrot, and mushrooms, plus a yummy seafood salad and "bitter choco pound" cake for dessert. To celebrate an important occasion, I went to Kamirori in the Philippines. As my friends would say, this would be "Filipino-style Japanese food." Price-wise, it felt similar to those in Japan. That is, if you want a truly Japanese experience, this is not the place to go. If you just want to fill your craving for Japanese food, this won't really be worth it. But other than that, the food tasted great. It's just not as Japanese as someone from Japan would expect. I asked a Japanese friend if he knows what Kamirori means. He said he never heard of the term. I'm thinking that this might probably be kami ryouri originally, i.e. heavenly cuisine, but that's just a guess. Well, the hotel itself isn't really expensive, but let me just put it this way. At the vending machines here, the drinks are 200 yen, not the typical 150 yen. And a plate of spaghetti is 1900 yen (almost US$ 25) when you order via room service. Not so bad, I guess, but I ain't giving in! The difficulty too is that this is so isolated from everywhere else that there are no nearby other restaurants nor convenience stores. The only restaurant choice you have are the ones in here. Buffet for 3300 yen (~$US40)? No thanks. 700 yen for this lunch set: rice, gyoza, pickled veggies, salad, and tonkotsu raamen / pork bone broth ramen, and sweet and sour pork / subuta (literally, vinegar pork). Pretty good for 700 yen. One of the "Christmas traditions" in Japan (and mind you, it's not at all a religious thing here), is the Christmas chicken. Guess who introduced this "tradition" to Japan. Complete with a Christmassy decoration. Lots of different nuts. There's a hardened chocolate top, plus a brownie-like main part -- i.e. so much more delicious than the usual chocolate sponge cake with fudge icing! Inaba brand. It's spicy but nothing I can't handle. Loved it. Forgot how much this costs, though, but I got it from the supermarket. They make it easier for everyone here. All canned food have easy-to-open cans -- no need for can openers! My full meal together with the microwaved yellow Thai chicken curry. 50 yen of shredded cabbage, with Caesar salad dressing. The karaage I have left, with some J-mayo. And rice. No! It wasn't meant to be a faux-sushi. Sushi usually comes with rice and at least one more ingredient. Nori, that green thing made from seaweed, doesn't make something sushi. In fact, nori can be eaten by itself -- the Koreans love it salted a bit, while the Japanese like it as it is. It can also be used to top rice in bento meals, or even soba or udon dishes. 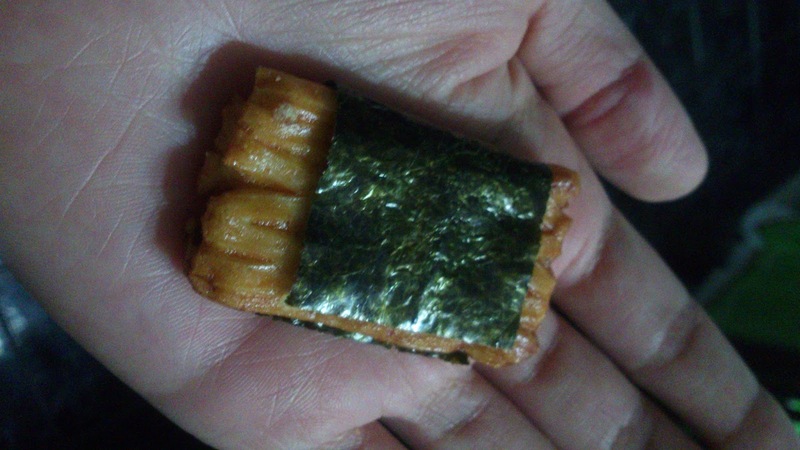 What this is in the photo is a rice cracker (senbei) that just happens to have nori. It's totally different from sushi. Senbei, though, is typically round and flat, but they now also come in other shapes and sizes. Like that one in the photo. You've heard about Google and can read, right? Bento! #194: "Christmas Plate" + Fruits! 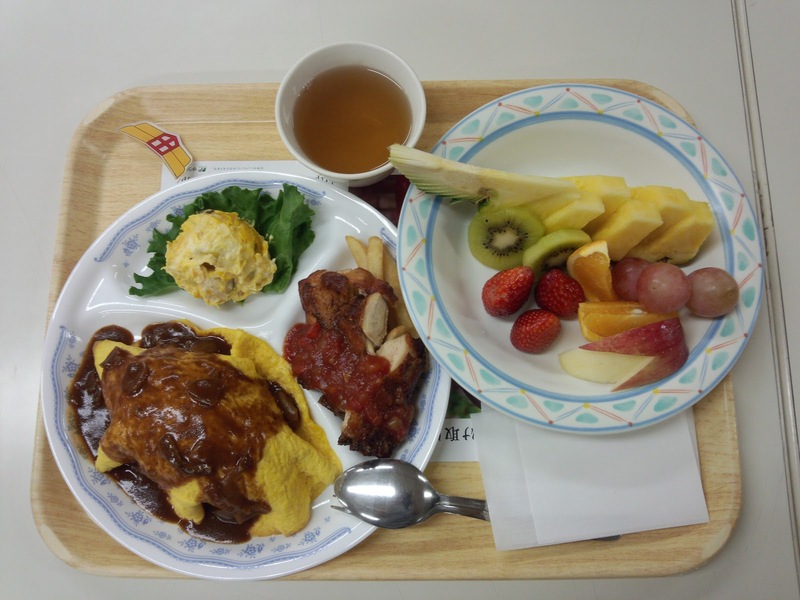 Christmas Plate / クリスマスプレート / kurisumasu pureeto, 460 yen from the cafeteria. It was their holiday special; I got this on December 21, 2012, the last weekday they were open before Christmas. Incidentally, on that evening, there were probably two Christmas parties in campus. I saw at least three Christmas trees. Cool. The "Christmas Plate" consists of omelette rice / オムライス / omu raisu, with demi glace sauce on top of the egg on top of "ketchup rice." Plus some roast chicken fillets with salsa on a bed of fries. And mashed pumpkin salad on a bed of lettuce. I also got the bowl of fruits, another special maybe only for this day, with pineapple (パインアップル / painappuru), kiwi (キウイ / kiui), strawberry (いちご / ichigo), orange (オレンジ / orenji), grapes (グレープ / gureepu, or 葡萄 / budou), and apple (りんご / ringo), all for only 180 yen. Yummy, yummy, yummy. I love salsa! Have a yummy new 2013, everyone!